If you’re looking to add a new deck to your home, it’s important to do your research on the best type of deck for your needs. There are far more materials to consider than just wood. Learning about the various materials and their benefits will help you make the best decision. Many homeowners are pursuing composite and PVC decks instead of high-maintenance wood. 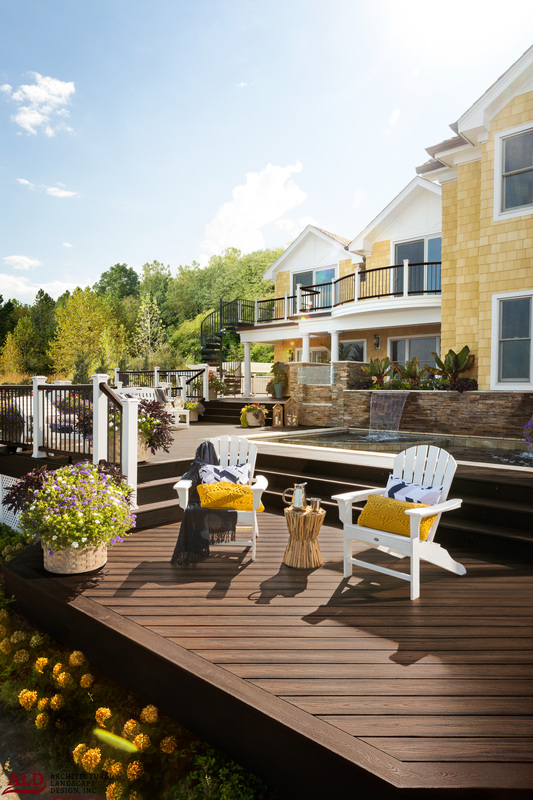 Trex and Azek decks are non-wood alternatives that reduce the hassle so that you can enjoy your deck even longer. Trex is a high-performance composite decking material, and Azek is a durable PVC decking material. They provide all the perks of a traditional wood deck without the drawbacks. Here are five reasons why these materials are superior to their alternatives. Trex and Azek decks keep the natural appearance of wood, but eliminate the hassles of maintenance. Wood decks require regular painting, staining, and sealing to stand up against the abuse of the outdoor elements. Over time, the wood cracks and requires replacement. Trex and Azek decks do not require paint, stains, or sealants. They are stain resistant and don’t fade over time, so they will always look as good as the day of installation. Cleaning is simple and easy, requiring only soap and a scrub brush! A composite-friendly cleaning solution and power washer may be necessary for occasional thorough cleaning. Even premium treated wood cannot last forever. Expensive cedar can rot in 10-12 years, and the quality of supply is worsening. Wood swells under different weather conditions and is prone to splitting or rotting. Termites and other infestations can shorten the life of a wood deck. Even with regular maintenance and repair, wood decks won’t last as long as your home. Trex and Azek’s synthetic materials are impervious to warping, rotting, or cracking. Both materials have a durable outer shell that resists scratches and weather damage. They are durable in any climate or region, and will last as long as your home. Trex is a composite material made from 95 percent recycled wood and plastic. Trex also has a long history of eco-friendly manufacturing without harmful chemicals. Azek is made from 36 percent recycled material. Neither material requires the harvesting of trees, which is perfect for the environmentally conscientious homeowner. Trex and Azek are the responsible and guilt-free options to improve your home with a deck without contributing to deforestation. Despite regular treatment and maintenance, wood eventually cracks and breaks with constant outdoor exposure. Naturally occurring knots in the wood can compromise its structural integrity. Wood that is knot-free is very expensive, and it isn’t immune to weather damage and breakage. The last thing you want from your deck is the risk of breaking under your family’s feet, or a child getting a painful splinter. These risks aren’t an issue with Trex and Azek decks, and you’ll never have to worry about splinters. Trex and Azek materials contain durable shells to resist damage and breakage caused by harsh weather. These durable shells also prevent moisture absorption that can lead to rot and failure in wood. Trex and Azek materials are also resistant to mold and mildew, so your family can enjoy outdoor time without breathing in harmful spores. The cost of constructing a Trex or Azek deck is comparable to the alternatives, and in some cases, they’re cheaper. The average linear foot prices are $2.50 for composites, $3 for plastic lumber, $3.50 for ipe tropical hardwood, nearly $4 for cedar, and $9 for aluminum, according to Popular Mechanics. Trex and Azek decks are relatively inexpensive to construct, and the lifetime cost is significantly lower than wood decks. Wood decks are more expensive over their lifetime due to the cost of products required for maintenance. Soap or deck cleaner is the only maintenance expense that you’ll incur with a Trex or Azek deck. Both Trex and Azek are the cost-effective decking solution to add value to your home without the inconveniences of wood decks. Both materials are available in a wide array of colors and designs, so you can find the perfect option for your preferences. Extensive warranties are available on both products to give you peace of mind. Whether you’re looking to resurface your existing deck or build a new one from the ground up, you can’t go wrong with a Trex or Azek deck.